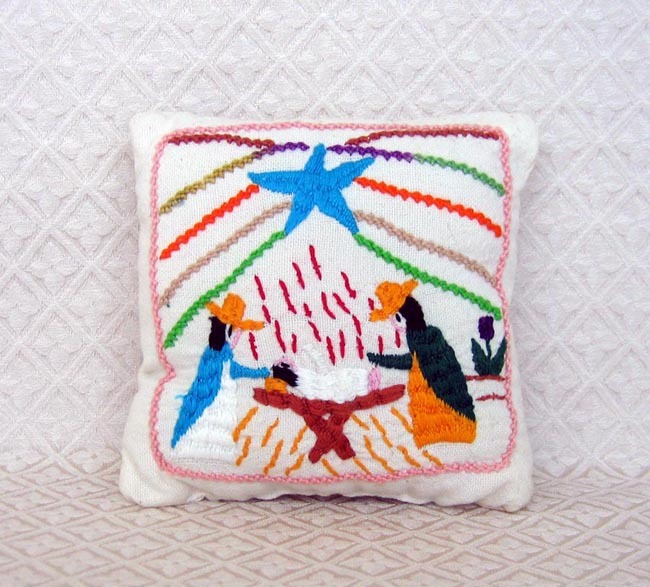 This pillow has a Nativity scene embroidered onto it. The embroidery is typical of the type done around Lake Patzcuaro in the State of Michoacan, Mexico. A sewing cooperative called Fuerza de Mujer (Power of Women) is located on the Plaza Grande in Patzcuaro. Formed in approximately 2001, the co-op is structured so that each woman works about a day a week at it. They first hand-weave cotton into manta and then embroider on the fabric. Their motifs include religious scenes and daily activities like fishing or dancing. Some of their pieces are large items like large table cloths and bedspreads. All profits are divided equally among the women. The pillow measures 5.75 inches by 5.75 inches.